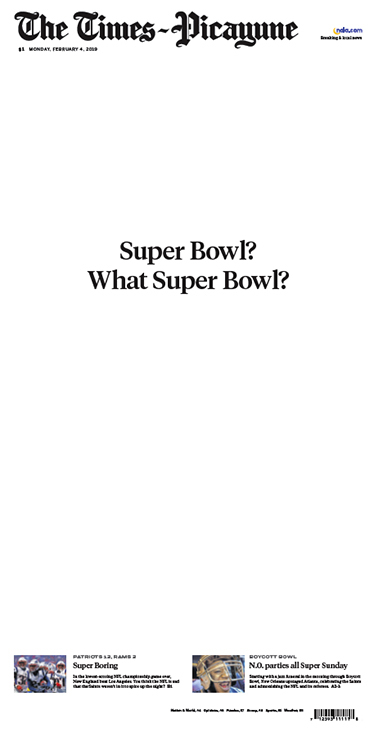 The Times-Picayune newspaper nailed Louisiana’s attitude toward the Super Bowl with a bold statement on it’s front page, above. Never underestimate the power of white space. JT thinks the absence of, well anything, on the page speaks volumes. JT has heard some folks questioning the NSU Student Card and how it puts a number of local restaurant type merchants at a disadvantage even though they offer NSU students a discount. The Student Cards allow the cardholder to use it basically as a credit card under their meal program…but only at two spots. It seems you can’t purchase a meal at any other location and charge it to your NSU Student card except Chick-Fil-A and Café Demon, both operated by the contract food service company at NSU. JT can certainly see Northwestern doing everything it can to enhance the student experience. Sometimes, it also enhances the community. JT understands Café Demon taking the NSU student card, after all, it’s located on the NSU campus in the Watson Library. However, Chick-Fil-A is not located on campus. It’s like the school is driving students to getting their fast food from them…..even though there are a couple other restaurants in town…and across the street from the campus as well. Sure comes across like a slap in the face to some of those businesses that have supported NSU for years and years. NSU needs to do something to make it right. They really need to expand their meal credit card system to be accepted throughout town. It’s the right thing to do….that is…to support the merchants who have supported them all these years. ——- Hats off to Natchitoches Convention and Bureau Executive Arlene Gould. She was recently elected Secretary of the Louisiana Association of Convention and Visitors Bureau. She also was elected to a second term on the Louisiana Travel Association Board of Directors and as their director this term. Speaking of congrats, JT sees by the financial report that the Christmas Festival ended the holiday season making money. Under the jurisdiction of Historic District Business Association (HDBA) they turned what used to be a one-day event into 45 days of activities since the Chamber and City turned the festival over to them. The unique thing is that they are always coming up with new ideas for the festival. Now if the City would just turn over the parking problem downtown to them, JT knows they could find a solution. Enrollment numbers released by Northwestern State show the highest ever Spring student population. NSU is recording 10,155 students. The enrollment numbers are critical because they play a huge part in the funding available for the university. Someone told JT they look at the numbers as you would attendance at a football game…they reflect paying attendees. You don’t care if they show up for the game or not…the main thing is they bought a ticket.